With 600+ locations Internationally, the Ellickson Draft Table is the World Leader in "personal pour" Draft beer tables. The Draft Table gives your customers the unique experience of pouring their favorite beer in a responsible, measured and controlled manner. Control your customers' consumption with our touch screen controller that sits behind the bar or at a service station near your Point of Sales System. Introduced to the United States in April of 2010, there are over 170 Ellickson Draft Tables helping our customers maximize their draft beer profits while reducing overall draft beer waste. Only requires a regular 110v power supply. Tables are managed wirelessly through patented RF technology. Comfortably fits two 15.5 gallon kegs & gas required to dispense the beer. Glycol chilled for optimal beer temperature. Position them anywhere! Great for outdoor patios! Two or four beer lines can be run to the tables. 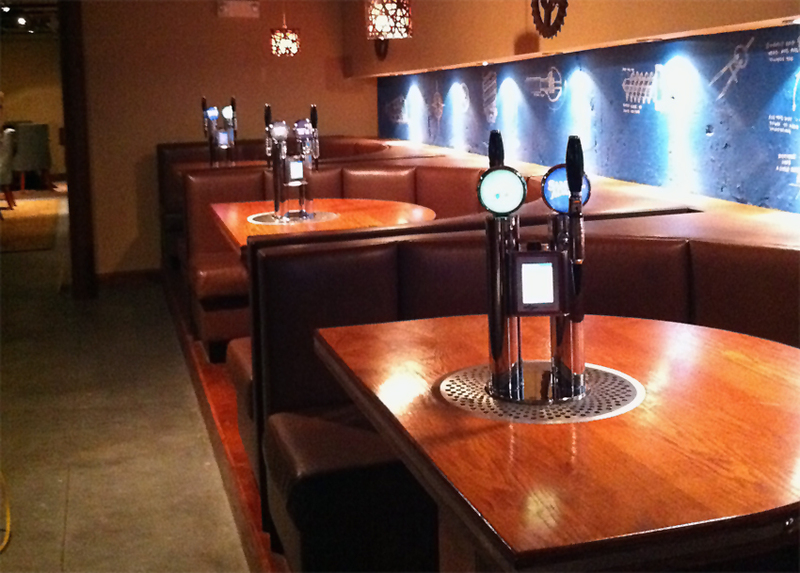 Taps can be added to any table top you want! My tables are booked weeks in advance Thursday through Sunday and I get a lot of walk in customers most other nights. They have been a huge hit for me. We sold nearly $40,000 of beer through our two tables in the first 30 days. My customers love the tables! I hear from some of them that their friends told them about the tables, and they showed just to check them out! I know they are driving traffic here! I originally thought leasing them was the best way to go but I soon knew that I just had to buy them as they would always be a permanent fixture. Our draft beer sales have doubled and there’s no waste like you typically have behind the bar! They have been a real success for us since we opened the pub…they are a great local draw! When they first arrived people had no idea what they were and it took a couple of weeks for them to realize that, YES, you could actually pour your own beer! Once they understood, and my staff let them know how they worked, we haven't looked back! We wanted something to bring our outdoor patio to life and the tables were just the thing for that! We have been voted best sports bar in Pittsburgh 4 years running, so we are always looking for something that gives us an edge over our competition. The tables have ensured that. We started out with one table but soon realized we needed at least two or three more to meet the demand we have received! The table changed the game for the area that it's in. It was our lowest grossing table in the bar and now it’s our highest, so that speaks for itself, really. Our bar got mentioned as one of the '101 things to try in Denver in 2011' partially because we have the tables. So they have helped put us on the map quite a bit, as well as generating profit. We tried 2 Draft Tables out in one location and expanded to 3 locations within 2 months because of their success. 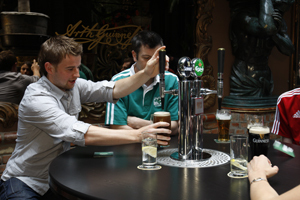 At first my staff thought people would tip less because they were pouring their own beer. But as it turned out, they tip as much or more than a regular table because they are having such a great time & their average check is higher! We sell more beer through our 2 Draft Tables than we do through 10 regular tables. Our customers LOVE these things. All images and website content are the property of EllicksonUSA LLC and may not be used without the written consent of EllicksonUSA LLC. Ellickson is the sole distributor of the Draft Table systems.